I’ve just begun playing a new-ish mobile game called Ingress. It’s been out on Android for a while but only became available on iOS this week. Ingress is an MMO that allows you to interact with a world map based on where you are in real life – landmarks such as churches and public art installations appear on the map and can be tapped in order to gain territory around them, as long as you are physically within about 40 yards of them. Likewise, a currency called XM is scattered liberally around the streets of the map, and you pick it up by physically walking by. You spend XM to build up friendly landmarks, which then give you weapons that you use to break down enemy-held landmarks and eventually take them over. The game so far is rather rough in some ways while weirdly polished in others. The tutorial is hidden away in a menu and I required multiple attempts at it before I understood what I was trying to do, yet the map is gorgeous and the missions in the game are fully voiced. The best thing about Ingress is the combination of watching your little phone scanner screen moving you around the map and realizing that there are probably other players out there who may notice you moving toward their territory – in real life, wandering around peering at your phone concernedly like you are trying to use a Swedish GPS app – and prepare to retaliate. 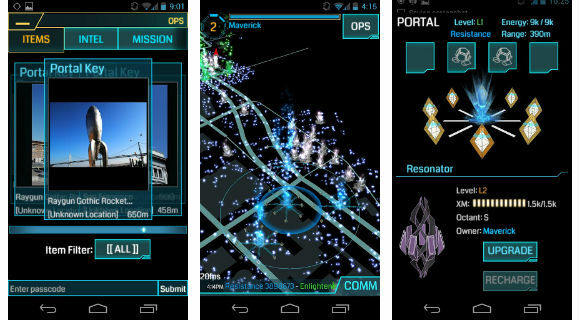 Ingress is free to download and play, and as near as I can tell does not bother you for money. The game will occasional reward a successful hack with an in-universe news item via YouTube, so it’s possible that they are making their money off of YouTube views somehow. Or it’s possible that Google is just fronting the whole thing as an experiment. Either way it costs you nothing to download Ingress and try it out; I’m enjoying the creepy vibe and strange mix of Foursquare and Watch_Dogs.